Ellie Dietz is our newest team member and office manager coordinating all the behind-the-scene details of the real estate transaction. 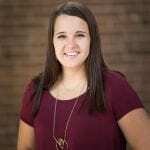 Ellie is a Boulder-native who played basketball and graduated from Mid America Nazarene University in Kansas City. Ellie has a passion for connecting with clients and is eager to learn more about the business. In her spare time, Ellie enjoys to golf, hike, and fish with her family.